We love this Make Ahead Ciabatta Sausage and Apple Stuffing! Ciabatta bread is a perfect bread to make stuffing with, along with apple and sausage this will be your new go to holiday recipe! Holiday dinners are the hardest meals to coordinate. The stress-O-meter runs at a constant ten. Everything has to be hot, and on the table at the same time and there are soooooo many dishes to prepare. Imagine how happy you will be, when you you realize at least one of the dishes is done and ready to go in the oven! Stress meter reduced to an even six.! Grandma and Grandpa are blowing kisses…your BFF is pouring you wine…everyone is happy because YOU are happy! What makes this Overnight Ciabatta, Sausage and Apple Dressing hold its shape overnight? Its the Ciabatta bread! A thick dense bread that holds up overnight. It’s a durable, its got some chew to it and it’s Italian! Thank you Italy, we love you! Clink! 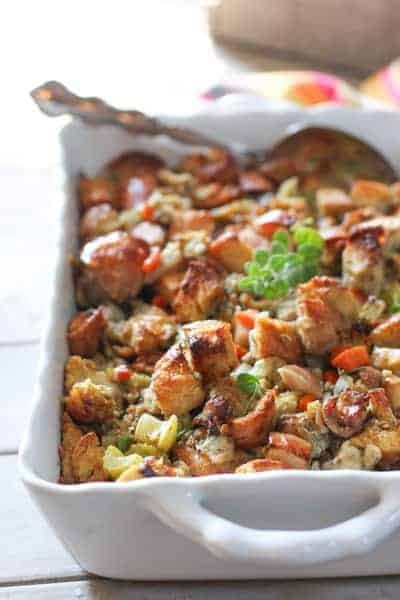 Simple is always best when serving mass amounts of people, and this is a simple, but super flavorful stuffing. No eggs to worry about. Just butter and broth. The sausage adds a ton of flavor and the apples add some sweetness and interesting contrast. This will feed around 8-10 guests and can easily be doubled. So count to ten my friends and take a deep breath. The Holidays are upon us. Do as much work as you can the day before and enjoy your family and friends! When your oven is full of turkey, use your slow cooker to make my Creamy Slow Cooker Mashed Potatoes. You cook and mash the potatoes right in your slow cooker! 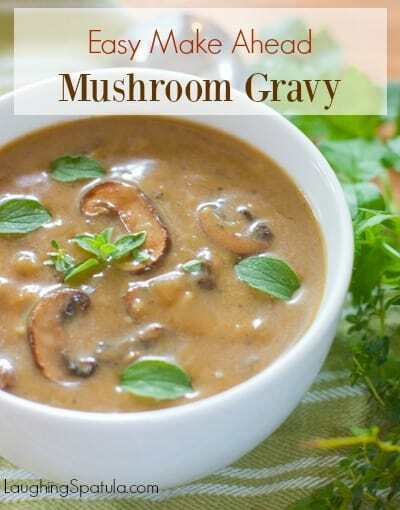 And don’t forget the Make Ahead Mushroom Gravy. Make a couple cups or a quart! 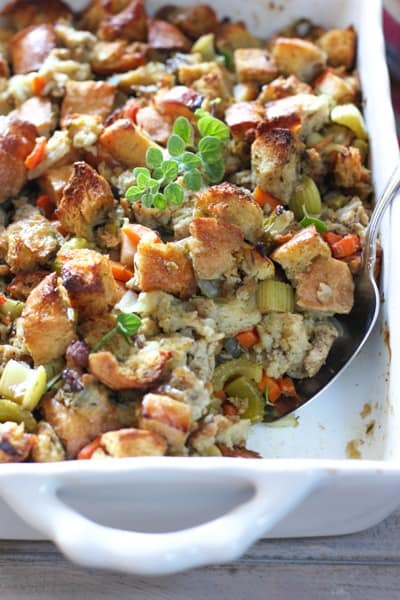 A super flavorful make ahead stuffing dish that can be prepared in advance! If baking now, Heat oven to 375°. In large skillet, cook sausage, stirring and breaking up meat into medium pieces, until browned, 8–10 minutes. Transfer sausage to a large bowl; set aside. Add butter to skillet; cook carrot, onion, and celery until soft, 5–7 minutes. Transfer to bowl with sausage. Add cubed bread and apple to bowl. Add stock, poultry seasoning, salt, and pepper to bowl; toss to combine. Taste for seasoning. More salt? More Pepper? Spread evenly in a buttered 9" x 13" baking dish. Bake until golden brown and bread is slightly crisp on top, 30–35 minutes. So sorry Diana! I updated my recipe card company and it kinda made it’s own rules :). 1 large loaf of ciabatta bread. Looks delicious, great idea thanks for sharing. 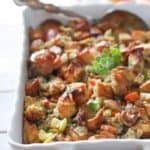 Stuffing is my favorite food on Thanksgiving and this variation looks amazing! That’s what I call a savory recipe! Thanks for the idea. That sounds delicious. I think that it would also work really well as a stand alone dish too. Great idea! Great recipe. I never thought about using Ciabatta bread. The older I get, the better I get at these holiday dinners–probably because I went through so many stressful ones when my kids were little.. As you said, I was intent on having everything hot and on the table at the same time. Now I make as much as I possible can ahead of time so I can actually enjoy my guests. 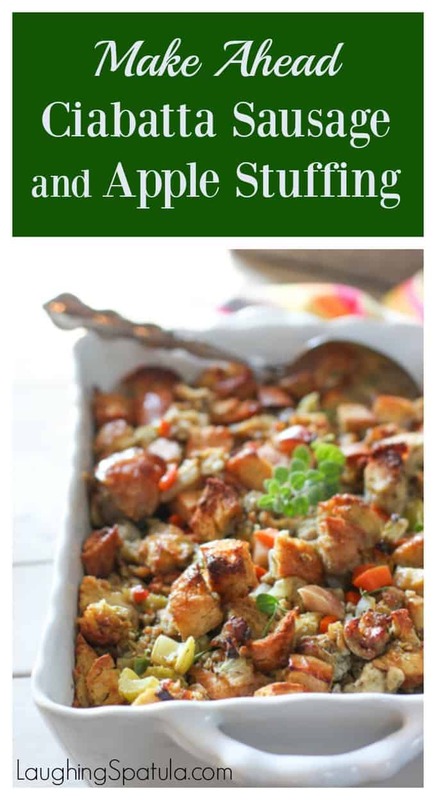 Your stuffing recipe sounds delicious! Thank you Elaine! I’m having T-day at my house this year for the first time in a long time and already making lists and taking my vitamins…oh and filling up the wine cooler! lol!